There is a comparison crisis affecting how our boys learn and I almost got caught up in it myself. Ah, comparisons. What a topic! The other day I called my husband at work when he was on break and said “I am having a crisis!” (LOL) He is a good listener and after talking to him I realized that my whole crisis came from comparisons. 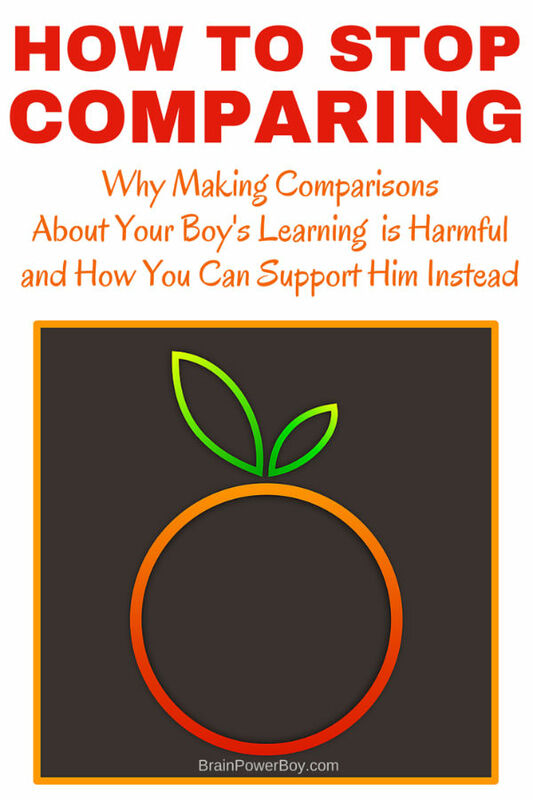 I was comparing myself to others; I was comparing what we were doing with what the whole of Pinterest was doing; and I was on the brink of comparing the learning my son is involved in with that of other boys who are nothing like him. That would have been a big mistake. Writing it down here makes it seem, well . . . all the more frustrating and ridiculous but I bet you can relate. I know better than to do this to myself and yet that bit of uncomfortableness, that feeling of inadequacy, that we are not quite good enough feeling still seeped in. It came just a bit at a time until it settled in my mind and that is when the trouble began—that is when I started, unknowingly, to compare. So today I decided I wanted to tell you something. Please Stop it! Just stop it if you can. The next time you catch yourself saying “Wow, I wish we could build a ship in our backyard like that family did” or “Jimmy’s mom took him on a trip around the world and they ended up living with the Aborigines and wildlife in the outback of Australia–just stop. Ok, those are extreme examples but the result is the same. You compare; you feel that you and yours don’t measure up. You know what? We don’t really like ships that much and have no real interest in hanging out with the dingos. What we do like, we can pursue—if we decide we want to do so. I get learning. I really do. I understand how it works, I love that it is actually a very natural thing and I know that there are ways that all of us learn best. I have done boatloads of research on learning because it is simply so fascinating to me. So what is with all the comparisons? Why is everyone from experts, to educators, to homeschoolers, to moms, constantly making comparisons and measuring their sons learning against that of other boys? Comparisons are prevalent in the classroom and schools are places of constant evaluation and comparison. It is not only unproductive; it is harmful. If a boy gets a negative feeling about himself and his abilities, that feeling takes a long time to go away and sometimes it never does. Think about your boy and what he is really like. Work together with your son to find what is important to him, what he wants to learn and how he wants to learn it. Have a laser focus on your own child (but don’t overwhelm him 🙂 ) and how he learns best. Strengthen him through your support but don’t drag him down through comparisons to others. Learning is personal. It really is. No two people will learn something in exactly the same way and they won’t remember the exact same things from a learning experience. We don’t really know what our boys are going to need for their own personal future. Yes, there are basics that we all need to know in order survive in this world but to compare where your son is in math with where another student is in math is pointless. What does it really tell you? Not a whole lot. 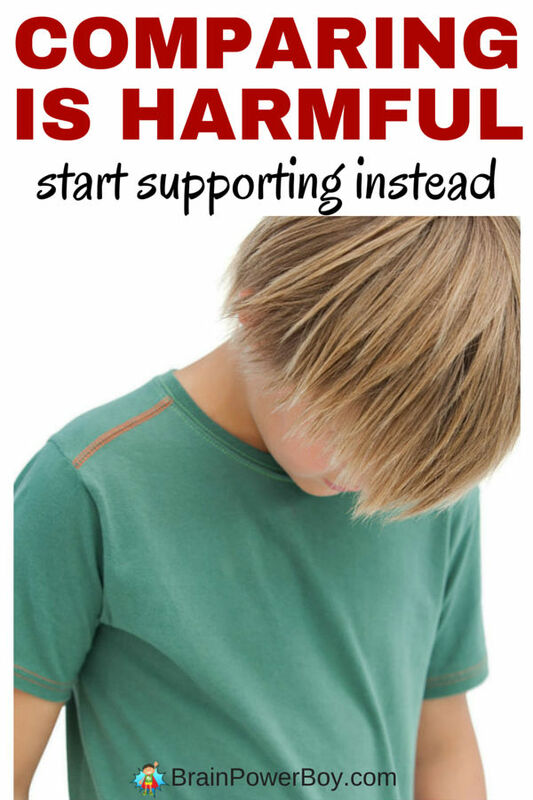 It can however be harmful to his self esteem and affect his confidence in his abilities. In our defense moms, it is rather natural for humans to compare things. We need to compare and contrast in order to survive. In simple terms, I would like the nice apple instead of the one with the big rotten spot please. If I just grabbed without comparing it could have been an issue for me. Silly example, I know, but there was a bruised apple in the fridge so that is what I thought about. We can also compare where we were at before to where we are now and that can be productive. Last year I didn’t know anything about cooking ribs but now I make a smashing rack that tastes almost up to restaurant fare. I must be hungry since my examples are tending toward food today. Here is a non-food example: It can be useful for your son to compare what his LEGO buildings from a few years ago looked like to the buildings he is making now. He can see just how capable he is and how he progresses as he gains more information and knowledge. If you can keep comparisons positive and motivational then by all means use them. But I find that most of us don’t go there. We tend to compare in a way that makes us feel less, that makes us feel that we don’t measure up. Don’t ever make your boy feel less by comparing him negatively, in any way, to anyone else—ever. You compare one type of book against another and find which works best for you. You have made a choice based on what matters to you. When you compare one book against another and decide which works best for your boy, well, perhaps letting him choose would work better in that case. What appeals to one person might not be what another would choose. FYI, I am not saying you shouldn’t pick out books for your son, just that letting someone choose for themselves likely results in different selections. The criteria you use for comparison may not equal what another would use and thus your choice may be very different. He might learn better from a book that he selected based on his own evaluations of the book. I’ll say it again, learning is personal. Basically, it can squash it. 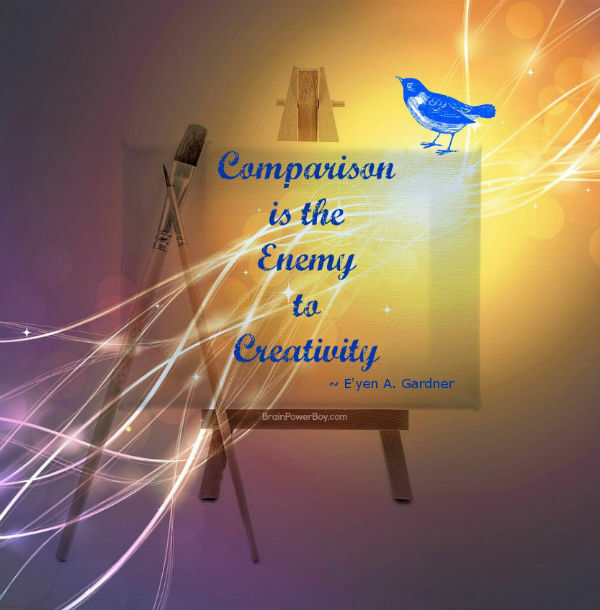 Comparison can squash creativity. If your boy is learning something new and is very excited about creating a new doohickey out of sugar cubes but you point out that Johnny already made that doohickey out of gold-coated premium sugar cubes and won an award for it and oh, here is his picture on the front page of the paper . . . do you really think he will want to continue? Some boys might persist but most will feel let down by your assessment of his ability to create this wonderful thing he had in mind. How can anyone know that what he was going to create wasn’t going to be the best doohickey known to man, maybe not on this particular sugar cube try but perhaps down the road? How will we ever know just how many boys had grand, wonderfully creative projects in their minds that never made it to the light of day all because comparisons of their abilities, their aptitude, and/or their intelligence made them feel that they might as well not even try. That is not only sad, but a horrible loss to us all. So that comparison can squash creativity is sad news indeed, but I believe that creativity can overcome comparison and win. What you have to do is be supportive and be quiet. Encourage your boy to use his creativity in ways that work for him. Encouragement is a sort of equalizer. I do not mean in a “good job” or “way to go” sort of way but in a “helping your boy get the supplies he needs” or “listening to him tell you about his project” way. Or, and I say this with all due respect, you can just be quiet and let him get on with his project. Too many moms are a tad too involved in their kids projects, are too vocal and tend to lead instead of follow. There is no reason to be constantly evaluating him and what he is working on. Provide the necessary tools and supplies that he needs to achieve his goals and let him get to it. Another equalizer is the fact, and I believe it is a fact, that we all have gifts. We can all be creative. Boys who feel supported in their creativity will be more likely to try new things. We don’t need to make their work seem to be of lesser importance by comparing it to that of others. We need to let them play, create and practice. More! There are so many choices today that you could use up all your time comparing one thing against many others. Think about all the choices for learning materials or about the cereal aisle in a large grocery story. The number of choices is simply crazy. Don’t waste your time making too many comparisons. Groceries are one thing but if you start comparing bit by bit, thing by thing, idea by idea, your boy against another boy, it just gets overwhelming. Takeaway—boys are not for comparing, cereal might be but do it quickly, time is precious. Constant comparisons are made by looking through Facebook, Pinterest, Instagram and so on. Social media has made it way too easy for us to compare ourselves and our families to others. This is not healthy. Honestly, if you are getting twinges that your son should be more, learn more or do more—just step away from the computer/phone/tablet and look him straight in the eye and smile at how beautiful and delightful he already is. One of the things that put me into crisis and a bit over the edge was Pinterest. I love Pinterest and all the delightful things you can find there. For a visual person such as myself, it is a mini paradise. But I could see all of the seemingly wonderful things that people were doing with their boys when I was on Pinterest and I thought that maybe, just maybe, I was lacking, or that we should be doing More. Have you ever felt that way? It kind of sneaks up on you – that feeling of Pinterest-dread. My husband pointed out, and rightly so, that More is not always better and that my son wouldn’t be likely to enjoy doing those things anyway. So, I resolved to ask my son if he was interested in several activities that I thought were neat. Um. . . the answer was No! (and with a capital N at that.) So I could have just skipped that whole part of the crisis and you can too. Many times comparisons cause needless worry. Make it your goal to just focus on your family. Provide what they need to follow their passions. Step away from whatever is causing you to compare in a negative way. I admit that it is sometimes not easy but it is so worth the effort, especially where our boys are concerned. Boys are surprisingly sensitive to comparisons. Comparing them to other learners does them a disservice and may end up actually making it harder for them to learn. Take some time to think about your boy today and how much he has grown, how many new things he has learned, and how simply wonderful he is . . . just because he is his own unique self. As for my own experience, I learned something from it and I will try to be much more aware of how it starts so that I don’t let it grab hold. I hope you can see how making comparisons about our boys’ learning can do more harm than good. Try to find ways to help your boys learn in natural ways (without comparisons 🙂 ) and they will thrive. In what ways do you support your boy’s learning? Leave a comment below. Feel free to use the sharing tools below–I would certainly appreciate it! I am pinning this to my Pinterest boards so I am sure to see it often. That way I will remember to keep comparisons in check! Find more information about boys’ learning on Brain Power Boy. Love it! Sheila thank you so much for taking the time to share your thoughts with us. In today’s world of Social Media it is all to easy to compare ourselves to others all day every day. Though I think we do need to remember that people are generally sharing the best bits of their lives with the world and keeping the not so great bits to themselves – the bits where actually if we did compare we’d find we were mostly all the same. My boy has ASD and learning difficulties so comparing him to other boys his age just doesn’t work. Instead we look at what he has learned today in relation to yesterday and we relish in his achievements. You are so right. The best bits, as you say, is exactly what many are sharing and that makes the comparison all the more destructive when it comes down to it. We are not even comparing on even terms. I love that you have decided to look at your son and his own accomplishments and achievements. That is what we all should be doing with our children – and with ourselves. I never gave much thought to comparisons, I’ve always been a big believer in celebrating what makes us different. But then my youngest started making comparisons between himself and his friends and I started to be much more conscious of that. We’ve started teaching about strengths (not weaknesses yet) and how everyone has different talents and that we can’t really compare ourselves to someone else because we are all different. Your tips in this post are going to be really helpful with continuing to teach him about healthy comparisons. It is so important for boys, and really for all of us, to celebrate our own unique qualities without worry about how we stack up against others. It is a very natural thing for us to do and when you start to become aware of it you will see just how often it happens. I’m glad you found the tips helpful. I think it is hard for kids to celebrate what makes them unique. It is great that you are having these conversations now. Thank you for taking time out of your day to read this rather long article. I love how you summed it up. Comparisons are causing some issues for families and I am hopeful that this post might help people to stop for a moment and think about the situation. Our boys deserve better. Everyone needs to read this! Our son has special needs and has been compared to the “average” child his whole life by everyone but me and my husband. Our son is who he is and that’s what makes him special. It doesn’t matter that other children his age are doing this or that as long as he is doing the best that he can and always trying. Thank you so much for sharing at the #Made4Kids Link Party! Thanks so much for your comment and for saying everyone needs to read this. You made my day. I really appreciate you sharing your story Karen.